IceCream! 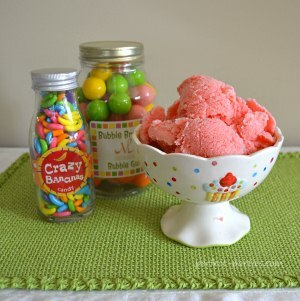 Easy Home Made Recipe for Goodie Goodie IceCream for Kids Birthday Parties. This easy to make homemade icecream is a cross between a sorbet and icecream and it's made with just three ingredients! This is similar to the popular Maui treat called Goodie Goodie or Guri Guri. This would be a great treat for a Hawaiian or Luau themed party. Make this treat with your favorite flavor soda and freeze for several hours. Place in freezer for two hours and then mix thoroughly. Repeat two times. Scoop into small containers for individual servings or serve into small dishes later. Let freeze for 8 or more hours. For those who do not know Guri Guri is, it is like a hybrid between Ice Cream and Sorbet. It's has a texture of a sorbet, but creamy like an ice cream. Guri Guri has been a favorite local treat for many years. The original treat is made in Kahalui, Hawaii on the island of Maui at Tasaka Guri Guri in the Maui Mall. It is a family run busines which also adds to the novelty of trying this refreshing treat. They have only two flavors but that's all they need...strawberry and pineapple. 2-5 scoops served in a Dixie Cup and another neat thing is the price. The owners have tried to maintain a very low price and you can get two scoops for a little more than a $1. This recipe is about as close as you can get to the real thing! It isn't quite as creamy but it is refreshing and sweet. It can be made with different flavors but we like strawberry the best.